Why Choose Gutter Guards By K-Guard? Long lasting durability. Durability is the key when it comes to quality gutter guards. A typical gutter without a guard is going to last a few years, but with the K-Guard system, you’ll enjoy a virtually unlimited lifespan. They are crafted out of aluminum, a heavy duty material that won’t corrode over time. They are specially coated to last more than 20 years outside in the elements. Our patented hangers are also designed to withstand the harshest weather conditions. Cost effective and affordable. K-Guard Gutter Guards offer a cost effective solution at an affordable price point. Once they’re installed, you won’t need to worry about hiring a gutter cleaning service several times a year, and you’ll also save yourself the time and hassle of frequent cleanings. The strength of the heavy duty aluminum ensures that they’ll stay intact throughout all types of weather conditions for many years, without needing to be replaced or repaired. The protection that they provide your home will also save you a substantial amount of money, as foundation and exterior damage resulting from poor or faulty gutters can cost homeowners thousands of dollars. Enhances the exterior. 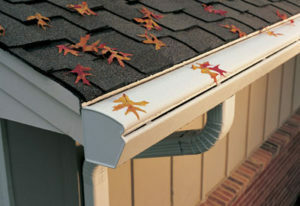 Many gutters are just plain unattractive and unsightly. The K-Guard gutter system has smooth, curved edges, giving it a sleek look that complements the roof line and flows seamlessly into the downspouts. It’s also available in a variety of color options, allowing you to create the ideal look for your home. Greater capacity, better drainage. The K-Guard system offers gutters that are 5 inches wide, allowing for greater capacity and better drainage. Debris materials that may collect in the gutters are easily flushed out, as it can take in more water and accommodate downspouts up to 3 x 4 inches in size. However, it’s important to note that with the guards in place, the only debris that may enter the gutters will be small, unlike open gutters, where leaves, branches, and other larger materials can fall in and clog the system. Consider these tips when choosing the right gutter system for your home. Durable gutters are essential to maintaining your home’s integrity over the years. With K-Guard Gutter Guards, you get an attractive, affordable, and long lasting system that saves you money.